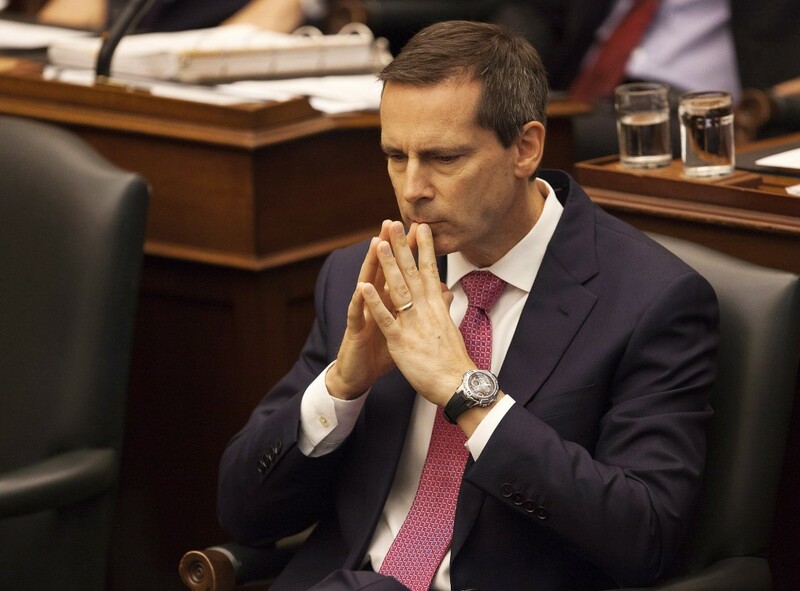 Premier McGuinty pensively plots his pernicious prorogation. My column appears in iPolitics under the title, “The Wrong Way to Limit a Premier’s Power to Prorogue.” I am grateful to Doug Beazley for having published it in the “Insight” section. The controversial prorogation of former Liberal Premier Dalton McGuinty lasted from 15 October 2012 to 19 February 2013. With the legislature back in session, the political backlash to this political tactic has just begun. The bill would also require that “the Premier shall also advise the Lieutenant Governor to summon the Legislature in accordance with the recommendation of the Assembly.” The Legislative Assembly would de facto prorogue and summon itself, and the Premier would no longer be able take responsibility the act of the Crown for prorogation. Despite the bill’s assertion that “nothing alters or abridges the powers of the Crown, including the power to prorogue, dissolve or summon the Legislature,” all the preceding sections would alter and abridge the power to summon and prorogue the legislature. The Lieutenant Governor’s powers to summon (and, implicitly, to prorogue) the legislature come directly from section 82 of the Constitution Act, 1867. Section 5 of the Constitution Act, 1982 further requires that the Legislature sit at least once per year, which puts the maximum theoretical duration of a prorogation at 364 days. The Legislative Assembly Act affirms those powers as part of the Constitution of Ontario. The Constitution of Ontario includes both the Lieutenant Governor’s written constitutional power to summon and prorogue and the uncodified conventions of Responsible Government that Ministers of the Crown take responsibility for all acts of the Crown and that the Lieutenant Governor acts on and in accordance with the Premier’s advice in summoning and proroguing the legislature. Fife’s bill even acknowledges that the Premier alone advises the Lieutenant Governor to summon, prorogue, and dissolve the legislature. This bill would limit how the Premier can exercise the discretion to advise and take responsibility for summoning and prorogation and therefore necessarily limit how the Lieutenant Governor promulgates that advice. The legislature cannot drive a wedge between the Governor and First Minister of the Crown without a constitutional amendment. However, the Legislature could pass a bill that better defines prorogation, provided that it also preserves the respective constitutional roles of the Premier and Lieutenant Governor. The Government would only have to advise the Lieutenant Governor to give the bill Crown Consent (if the provincial legislatures, like the Parliament of Canada, also recognize this procedure). The Legislature could amend that law such that the Lieutenant Governor issues two proclamations (on and in accordance with the Premier’s advice): the first would prorogue the legislature and the second would summon the next session for despatch of business at, say, intervals of 40 days. The Premier could only advise the Lieutenant Governor to extend the intersession through another 40 days through a subsequent proclamation. Such an amendment would bring Ontario in line with the federal convention on prorogation. Second, the legislature could also amend the Financial Administration Act in order restrict Special Warrants to periods of 60 days and only when parliament is dissolved. The federal parliament adopted such a reform in the 1990s. Special Warrants give the Government an emergency power to implement spending without first obtaining parliamentary authorization, which directly contradicts the historical and modern purpose of parliament. The current legislation allows the Lieutenant Governor to issue Special Warrants on and in accordance with the advice of the Government “if the legislature is not in session,” which includes both the intersessions when parliament is prorogued and the writ when parliament is dissolved. Special Warrants are a pure statutory power and pertain neither to the written constitution nor to constitutional conventions. MPPs could simply amend section 1.0.7(1) of the Financial Administration Act to read “If the legislature is dissolved” without raising any constitutional questions. By restricting the Special Warrants to the writ, the legislature would place an indirect but practical and important limit on the duration of a prorogation. Whenever the Government ran out of money during an intersession, Parliament would have to be recalled in order to approve any additional spending. NDP leader Andrea Horwath has touted this bill as “taking the politics out of prorogation.” In reality, this bill would inject even more politics into every subsequent prorogation – particularly in a minority parliament – and would be unconstitutional. Thankfully, the Legislature could amend the bill at committee so that it both promotes the same principle of better defining prorogation and conforms to the constitution. James W.J. Bowden is an M.A. Candidate at the University of Ottawa. This entry was posted in Crown (Powers and Office), Prorogation and tagged Andrea Horwarth, Catherine Fife, Dalton McGuinty, s.41(a), Special Warrants. Bookmark the permalink. I come at this from a perspective rather different from Steven Spadijer’s. As I read it, section 41(a) of the 1982 act refers an “amendment to the Constitution [i.e. *in its current form*] in relation to […] the office of […] Lieutenant Governor of a province”. In its current form, the Constitution includes s.65 of the 1867 Act, which vests in the Lieutenant Governors of Quebec and Ontario all powers previously vested in the Governor or Lieutenant Governors of the provinces of Canada, Upper Canada or Lower Canada by any law of the British, UK, Canadian, Upper Canadian or Lower Canadian parliaments, subject to being abolished or altered by the legislatures, excepting powers originating in British or UK legislation. As far as I can tell from a shortish perusal of pre-1867 constitutional acts, the powers of prorogation and dissolution are granted in section XXVII of the Constitutional Act, 1791 and are thus shielded from direct abolition or alteration by s.65. As B. Thomas Hall says, this act only controls the exercise of the Premier’s power to advise the Lieutenant Governor as to prorogation under s.45 of the Constitution Act, 1982, and does not illegally seek to abolish or alter the LG’s ability to exercise that power, so as far as I can see it is quite intra vires the legislature under the Constitution Act, 1982. I agree with you that the Legislative Assembly Act should be amended so that a date has to be fixed for the beginning of the next session whenever the Legislative Assembly is prorogued. I also agree that the use of special warrents should be prohibited during a prorogation. Putting aside the merits (it makes prorogation a form of adjournment) and effectiveness (it leaves a big loophole to prorogue) of Fife’s bill, I cannot agree with you that it is unconstitutional. Section 45 of the Constitution Act, 1982 (which effectively replaced section 92(1) of the Constitution Act, 1867, and has the same scope as the latter section), gives the provincial legislature the power to amend the constitution of the province. The Supreme Court of Canada, in O.P.S.E.U. v. Ontario (A.G.)  2 S.C.R. 2, defined the constitution of the province as consisting of matters involving “the operation of an organ of the government of province”. Consequently, the scope of s. 45 should be similar to that of s. 44 despite the difference in wording. Thus, provincial legislatures can alter their executive or legislature institutions (subject to the exceptions in s. 41). Fife’s bill does not touch the office of the Lieutenant Governor: it only deals with the operations of the Executive Council, or to be precise, the actions of one member of the Council. Just as operations of the Queen’s Privy Council for Canada are within the scope of s. 44 for the federal Parliament, the operations of the Executive Council are within the scope of s. 45 for the provinces. Those operations include the giving of advice to the Lieutenant Governor. The preroratives of that office are not affected by the bill. “The legislature cannot drive a wedge between the Governor and First Minister of the Crown without a constitutional amendment”. Parliamentary supremacy is as much an axiomatic principle in the constitutional law of Commonwealth nations like Canada as is responsible government itself. Yes, the constitution binds Parliament, but so long as the limitation or regulation is reasonably and proportionately adapted I do not see the problem. Or put another way: the proposal does not eliminate or completely extinguish the power (say, in the way, the Re Initiative Case did by completely removing the Crown from the legislative process by no longer requiring royal assent be given to voter initiatives). The bill here merely prescribes the manner (via a condition precedent) as to how and when the power is to be exercised; the Crown is still an integral part of the process. Hence, why the bill correctly claims, “nothing alters or abridges the powers of the Crown, including the power to prorogue, dissolve or summon the Legislature”. The power, in law, remains. They are not “denied”. They are merely controlled. One might think the word “may” imposes an unfettered discretion. So could the Australian Parliament prohibit the times which elections could be held? Apparently it could: recall Kerr justified his dismissal because statute regulate s5 by prohibiting an election being held before Christmas. So the GG could not dissolve Parliament during this window, despite the express discretion that the GG “may” dissolve Parliament. If time prohibitions are possible, so why not procedural prohibitions? Indeed, the UK Parliament can now only be dissolved if Parliament dissolves itself! If provisions like s5 are merely declaratory of the common law I would see no problem if countries in Australia did the same. Why? Because the Australian constitution operates under the backdrop of Parliamentary supremacy, the power to “limit or replace” is legitimate so long as the power still exists and does not violate an express constitutional prohibition like the 30 day limit cited above: ‘the exercise of either executive or legislative power is subject to the provisions of the Constitution’: Australian Assistance Plan (1975) 134 CLR 338, 406 (Jacobs J). he executive cannot make good an independent sphere of its own, without legislative interference and control. For those who also support judicial restraint (that is statutes should only be struck down if they violate an express prohibition beyond a reasonable doubt) should also oppose the analysis provided by James. IMO, requiring the legislature prorogue Parliament supports the basic principle government, namely, no running way from motions of no confidence. You cannot avoid criticism of your actions by proroguing the legislature in a way which would make William IV sob with envy. I agree, but if a constitutional amendment were made it would be this: t a minority of Parliament to summon itself, and an absolute majority is required to adjourn it (prorogation no longer exists, but the absolute majority could very well be introduced in Canada). This could also be advantageous for the Crown for if Parliament can prorogue itself then there is no need to blame the Crown anymore. It was the decision of the legislature to prorogue and therefore TOTAL blame resides with it. PPs ‘Section 5 of the Constitution Act, 1982 further requires that the Legislature sit at least once per year, which puts the maximum theoretical duration of a prorogation at 364 days’. If the provision is not mandatory (that is it is merely directory) then courts cannot enforce it. It requires the reserve power of the Crown to summon the legislature if 364 days pass. That’s all well and good, but section 41(a) of the Constitution Act, 1982 invalidates this analysis with respect to Canada. But those cases which involved section 41(a) often had the legislature extinguishing the entire power (that is, the veto power was completely removed so the Crown was no longer even by of the legislature!) or the office altogether bypassed (the Clerk of the House could give effect to French language bills). If s41(a) is taken to mean avoiding radical change (completely extinguishing vice-regal rights, or obscene destruction of the office) I would agree with you. But the mere fact the powers are regulated, yet still intact, seems to me constitutional. The powers of the LG remain; the bill simply requires Parliamentary procedure leading up to the exercise power which is regulated. The LG is still part of the process; indeed, without the assent of the LG a prorogation cannot occur (hence, totally different to the cases referred to above where the Crown was not part of the process). By your logic, the government could not even regulate its own election laws. For example, if the legislature prohibited a limitation on the LG to dissolve Parliament 4 weeks before Christmas (where the electoral office is low on resources) that would be “unconstitutional” because it involves “interference” with the office of LG and its “unfettered discretion”. But if this is allowed, then why not any regulation of any conditions leading up to the power to exercise prorogation (either during sittings or even in lead up to elections)? In any event, regulating a power is altogether different to radically re-altering the office or removing a power. One could make federalism-based “experimentation” argument, that is, the original understanding of s41(a) was never intended to blanket prohibition on the provinces to experiment with regulating (as opposed to removing) the powers to prorogue, dissolve, summon etc. It was merely there to ensure the institutional integrity (the powers) of the office remains. As I said, if a law is to be struck down the case for it being struck down should be beyond reasonable doubt. A linger doubt remains here. To be sure, it will boil down to how broadly the courts have defined s41(a) – is a modest regulation unconstitutional? Or does the Crown (really the responsible minister) have an unfettered, unabated power to dissolve do what want it wants, irrespective of what a provincial legislature wants? It remains to be seen, but I am somewhat unpersuaded until the Supreme Court issues its ruling were the matter ever to reach that stage. Also to clarify my citation of Australian cases: what these cases show is that other countries with written constitutions are willing to defer to Parliament so long as there is no express constitutional prohibition (or a prohibition resulting from necessary implication). So although the GG “may dissolve Parliament as he thinks fit” that does not mean the legislature cannot put limits on the exercise of such a power, but it DOES mean those powers cannot be “denied”. Similarly, although the Canadian constitution protects the office of the LG, denying or eliminating a power is different to modestly regulating it. So I am not sure, at least on the cases I have seen, that it “invalidates” this analysis. If it does, well like American’s, Canadian’s appear to be stuck in a system of judicial oligarchy – where you have to get the courts to amend the constitution given existing amendment procedures are so cumbersome.